Has your child has come home from school or an after-school coding club talking about Scratch? Or maybe you've heard that it's a good way to get kids into coding? What is Scratch? And how can you help your child to get started or build on their enthusiasm? In this post we'll cover the common questions that we get from parents who have heard about Scratch but don't really know what it is yet. Scratch allows children to program (code) their own interactive stories, animations, games and music. Scratch is 10 years old and very well established as a great way for children aged around 8+ to start coding. Scratch runs in a web browser or as a program on a desktop or laptop computer. How much does Scratch cost? The very first thing we should say is that Scratch and Scratch Jr are free. Yay! Can we use Scratch at home? Yes, you can absolutely use Scratch at home. It's not one of those things that's only available to schools. Do we need an account? You don't need an account to get started with Scratch and you can use it without an account for as long as you like. However creating an account has additional benefits including being able to save your projects in the cloud and share them with others. Once a child has an account they can share their work and comment on other people's projects. This is awesome. But it's important to understand what it means and have a discussion to prepare your child. 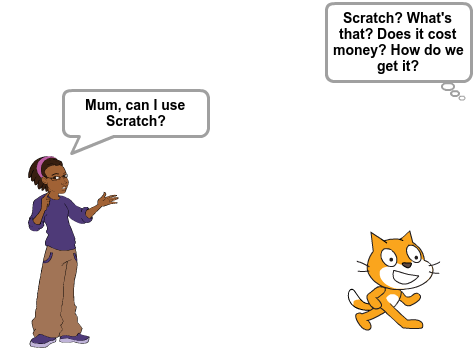 You can find out more on the Scratch parents page. You don't need an account for Scratch Jr.
Do we need to install anything? You can use Scratch in a web browser without installing anything. You can download and upload projects without an account. You can download an offline version of Scratch if you prefer but you don't need to. 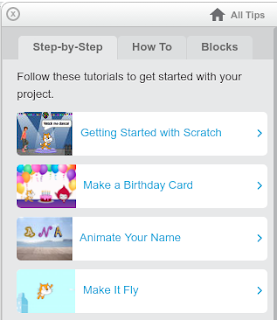 Scratch Jr is an app so you'll need to install it from the app store for your device. What do we do with Scratch? So you've got Scratch (or Scratch Jr) all set up and there's a cat there on the screen (the cat is called Scratch by the way.) What do you do now? What are you supposed to do? It's okay, this is a really common question. Try things and see what happens - Some kids and parents are happy to dive right in a start experimenting to see what happens. If you're looking for permission to just start poking around, you have it! Try the step-by-step tutorials that are included in Scratch - They appear when you open Scratch and you can get them back by clicking on the question mark on the right hand side of the stage. The tutorials take you through creating a project by showing you what to do. They're great for beginners and for days when inspiration doesn't strike. Visit a Coder Dojo or other local coding meetup - A Coder Dojo will have mentors and more experienced kids to offer advice; project ideas and cards to get you started and other families in a similar situation. View and Remix a Project - If you click Explore at the top of the Scratch website you can look at projects that other people have made. You can 'look inside' to see how the project was made. And you can 'remix' the project to make changes. This is a great way to learn what is possible in Scratch. Buy or Borrow a Scratch Book - Some kids and parents like idea of working through a structured book. 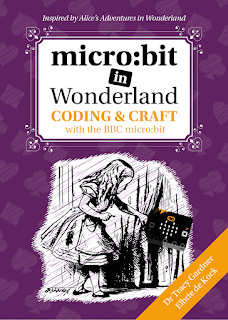 See our list of Coding Books for Young Kids and our review of Super Scratch Coding Adventure for some ideas. We get this question too. 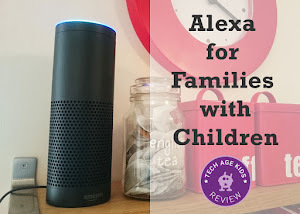 Either from techie parents who are bit skeptical about something so colourful and graphics-based, or from cautious parents who want to be sure they're doing the right thing for their kids. To both sets of parents, yes it's fantastic. 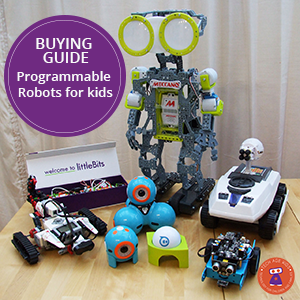 I have a Computer Science PhD, two kids who learned to code using Scratch, I've taught primary school computing and I write educational tech content for families and kids. I love Scratch. 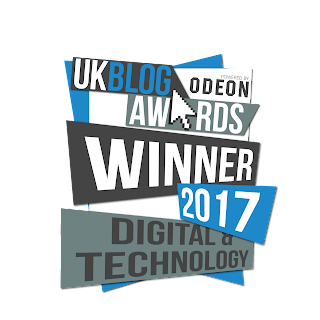 I wrote about Why I love Scratch as an Introduction to Coding when my own kids (now 8 and 10) were first learning. If you're unsure about the idea of drag and drop coding then read Graphical vs Text-Based Coding for Kids. ScratchJr is a collaboration between the DevTech Research Group at Tufts University, the Lifelong Kindergarten Group at the MIT Media Lab, and the Playful Invention Company.